Allow informal conversations to take place on whatever subject your employees want to bring up. 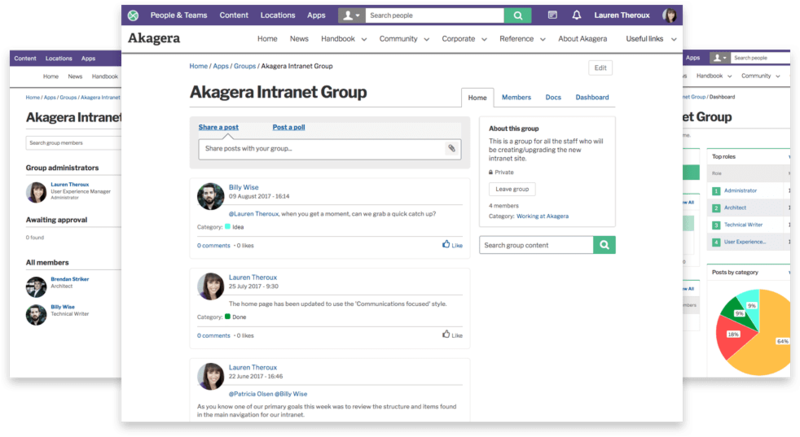 Open up new avenues of collaboration, across teams and hierarchies, using Invotra groups as an area to share documentation. Enable collaboration using Invotra Groups. Give your users the power to create self organising digital conversations. Initiate discussions with individual posts on the Group wall, then reply to others who have also posted. Collaborate on content inside the group using Invotra Group Docs. Group administrators can fluidly alter the membership of the group from across your organisation. Set your group to be public accessible to all, private to require a joining request, or secret to be only visible to those members you have added (and senior administrators). Your digital transformation starts with the Invotra Groups collaboration tool. Invotra Groups can be formed by anyone in the organisation, across multiple departments, and are not created using HR data like Invotra teams. For security, or just to allow you to plan that surprise retirement party, groups can be made public, private or secret from uninvited users. Keeping members up to date with all the developments in your groups, notifications are sent to group members when another user joins their group or content is added to the group. Finally the group dashboard allows users to see the level of engagement in the group, representing engagement by team, location, role or less structured data like #tagging in group posts. Different from Invotra Teams, Groups can be formed by anyone in the organisation, across multiple departments. The group dashboard allows users to see the level of engagement in the group, representing engagement by team, location, role or less structured data like the most liked content in group posts. All group members can share a post, post a poll, comment on another member’s post and all members can create and share documents within their group. 4. Users are notified when another user joins their group or content is added to the group. 5. Groups can be public and open to all users, private so that users have to request to join, or secret where only invited members can see the group.